I guess I could use any avatar you have on hand or make for me. Much appreciated! I'd be happy to create an avatar for you. Give me some ideas though of what you want! Monkeys, flowers, anything is possible. Just tell me what you like! I found this one in photobucket. It sparkled there but it does not here. so you might as well have some input. If you don't reply ...I'll start making *something* in an hour for you. Here are a few that I made recently and not posted, was thinking of using one on St. Pat's Day myself, but if you'd like to use one of them, go for it! I usually take a poster's original avatar and decorate it for holidays. If you come up with something you'd like to use for an original avatar, or everyday avatar, I'll be happy to do that for you. I'd even be happy to make you an everyday avatar if you can let me know what you'd like as the subject of it. In the meantime, if you'd like to use one of these, the URLs are given below. Thank you Brandi! Much appreciated! Brandi, I have a very special request. 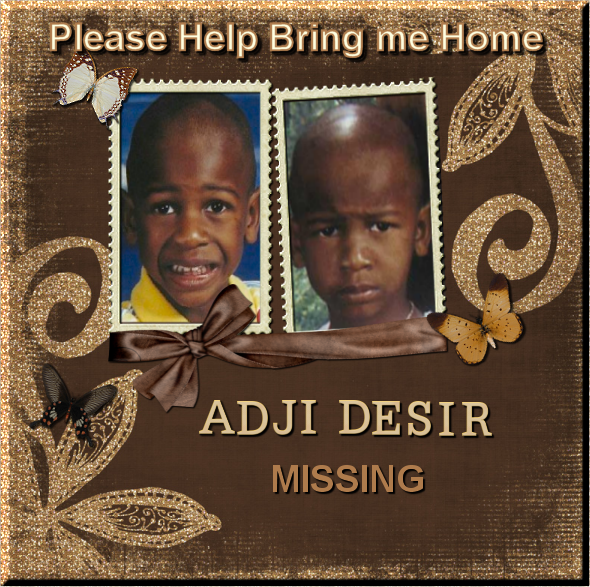 I have been working on a website for Adji Desir, could you make me a nice special picture for the site??? Searching, like the ones I make for Haleigh? Have any special pictures you'd like in it? If not, I can go search for some. Don't know if there is more information you'd like in it, but that's my first try. Maybe add "Help bring me home" or something like that? It is very nice, the colors and background are great!! I have not been able to find any other pics of him, I wish I could!! Ok, I'll add that text to it for you! Brandi, will you dress me for Easter please? If you can, could I have some pretty flowers and another bow. I love Easter and it is this monkeys favorite holiday. Oh and maybe a few eggs? I already have made 4 Easter avatars for you to choose! I'll post them right after St Pat's Day unless you would like yours sooner. Let me know! Did you see the St Pat's Day avatars I made for you? YAY FOR ME. THANK YOU, THANK YOU, THANK YOU. I Sparkle and everything. Job well done - hooorayyyyy for me!!! Oh I do love the bows!